This series of delightful short stories offers invaluable economic tips and tools for financial success that have withstood the test of time, and are still applicable today. These lessons are relayed through legendary tales set in ancient Babylon. Listeners will learn how to acquire money, keep it, and put it to work to make even more money. 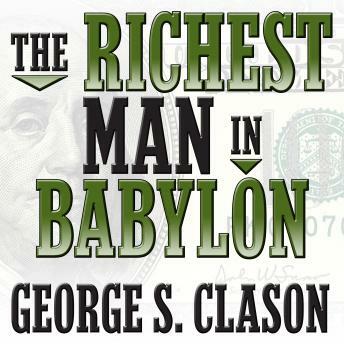 The greatest book about personal finance! Maybe there is nothing new, but anyway this book is the best. Great listen, lessons we've all heard before with that extra push! Letting you know its all possible! An ancient story about finances which can be applied even today! Talks about copper, silver and gold which was their means of money and ways to retain and earn more of them. I have only had the opportunity to listen to just a few episodes and am really just hooked. I couldn't believe that there is such a treasure hiding in plain sight. I love it. This book is amazing and if allit's readers take heed, they will see the difference in their lives. Awesome book! l am so fired up! jus got my groove back on my reading culture! Really amazing. Awesome !!!!!!! I loved it, I felt as if I were in Babylon myself. I can take the lessons from this book and pass them on to my children. I really appreciated listening to it. I loved listening to the book, it saved me so much time. The book itself was okay.